In New Orleans, the celebration of Mardi Gras is defined by the final three days prior to Ash Wednesday, when the lenten season begins leading up to Easter, but at Universal Studios Orlando, Mardi Gras is extended out beginning on every Saturday night and other select event nights beginning on Saturday, February 6th, 2016 through Saturday, April 16th, 2016. Like the carnival celebration in New Orleans, the Universal Studios version consists of jazz, gumbo, jambalaya, a parade, concert, and lots of bead necklaces. However, whereas the Louisiana version can get very rowdy and a little out of control, the Orlando version is kid friendly and fun for the whole family. Mardi Gras is celebrated in different cities all around the world. The Universal Studios version of Mardi Gras pays homage to the New Orleans version of Mardi Gras with live bands that have their roots from New Orleans and great creole dishes that take place in their French Quarter. The festivities get under way at 5 PM every Saturday night and on other select nights which is followed by a night time parade and finally a concert by a major recording artist. The Mardi Gras Parade at Universal Studios is one the best events to attend at Universal Studios and is a nighttime parade that consist of Mardi Gras themed floats, stilt walkers, Zydeco music, and beads to be caught (see video below). The parade has an authentic Mardi Gras feel to it so the entertainment value of the parade consists of admiring the parade floats, outfits, and catching beads and less on any kind of choreography that the parade participants would be doing. The parade typically begins 30 minutes prior to the beginning of the Mardi Gras feature concert for the night. Every Saturday night immediately following the parade is a concert by a major music artists that spans multiple genres across each weekend. Universal has setup the weekends so that a different group of fans can attend when their genre of choice will be playing. For the 2016 event, artists such as Fall Out Boy, Diana Ross, and Shawn Mendes will be performing. Click Here for the entire list of Mardi Gras concerts with their dates and music videos of the performing artists. Outside of the official festivities at the park, you can use your theme park ticket for free admission to Pat O’Briens at Universal Citywalk that celebrates Mardi Gras 365 days a year with great cajun food and dueling piano’s that stays open until 2 AM. For dinner, what better way to celebrate the best that the Big Easy has to offer than by eating at New Orleans native Emeril Lagasse’s Emeril’s Orlando Restaurant at Universal Citywalk. If you want to stay at a Mardi Gras theme hotel, your best bet is to head over to Disney World to stay at the Port Orleans – French Quarter Moderate Hotel in the Downtown Disney Area. Also, Princess Tiana and her prince are available for meet and greets in the Magic Kingdom. Hotels on Universal Orlando property to make a weekend out of it include the Loews Portofino Bay Hotel, the Loews Royal Pacific Resort, and the Hard Rock Hotel that all have ferry access to Universal Studios Florida. Click Here to visit the official Mardi Gras site at Universal Studios Orlando. 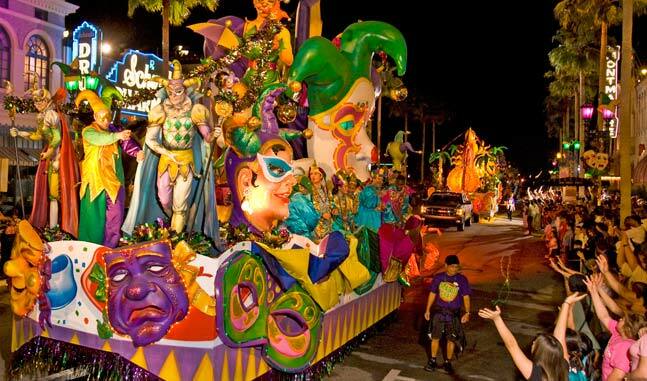 Click Here to read about various carnivals going on around Orlando throughout the year. This entry was posted in Attractions and tagged annual events, april, carnivals, citywalk, february, march, mardi gras, parades, spring break, universal, universal studios. Bookmark the permalink.